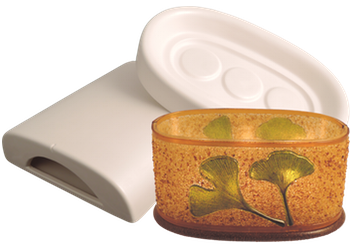 The Oval Votive mold set has two parts. One piece casts the bases. 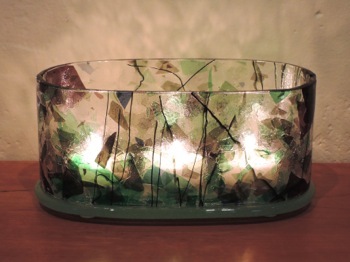 The other; forms glass panels into the finished pieces’ sides. The large panels can serve as canvases to be embellished with frit balls, noodles, rods, stringers, and cast elements. 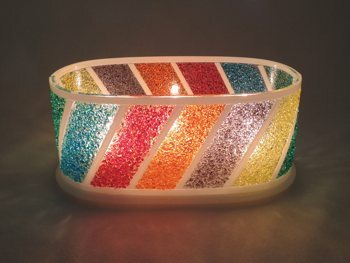 However, beautiful Oval Votives can be created with just two sheets of art glass. The finished votives can range from about 2.5 inches (65 mm) to 6 inches (150 mm) tall. 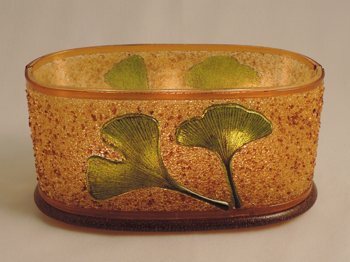 The base is about 7 inches (17.5 mm) wide. They use 3 tea lights. The molds measure 8.5x5.25 inches and 6.75x6.5 inches (22x13.5 cm and 17x16.5 cm). 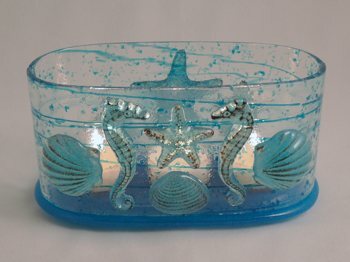 The wonderful results and easy-to-follow instructions make this mold perfect for both beginners and experienced artists. The casting mold holds 300 grams of frit.